Give up? 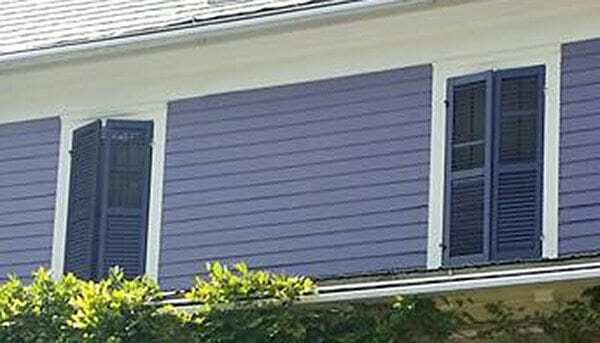 Don’t want to buy new exterior wood shutters? By now you should thoroughly understand the correct and ideal way to mount shutters is to use hinges even if you plan to only use your shutters as decoration. There is one option, or should I say a trick, to be used only as a last resort. I only provide this information to those who will not purchase hinges as advised, in my effort to reduce the number of ugly houses. Even if you have a vinyl sided home, with vinyl shutters, and have no intention on replacing them, you can still achieve a more authentic look. Screw two, 1-inch thick blocks of wood on each side of the window casing near the opening where the hinge would normally be. You may need to shave off the outside corners of the blocks. Take the shutter and screw it to the blocks of wood on the window side, and the other end of the shutter directly to the facade of the house. This will result in an angled shutter – creating additional shadows – resulting in a much much better looking home. Another shortcut is attaching a false tilt rod. Purchase a wooden dowel, paint it and attach it to your louvered shutters with a liquid nails adhesive. 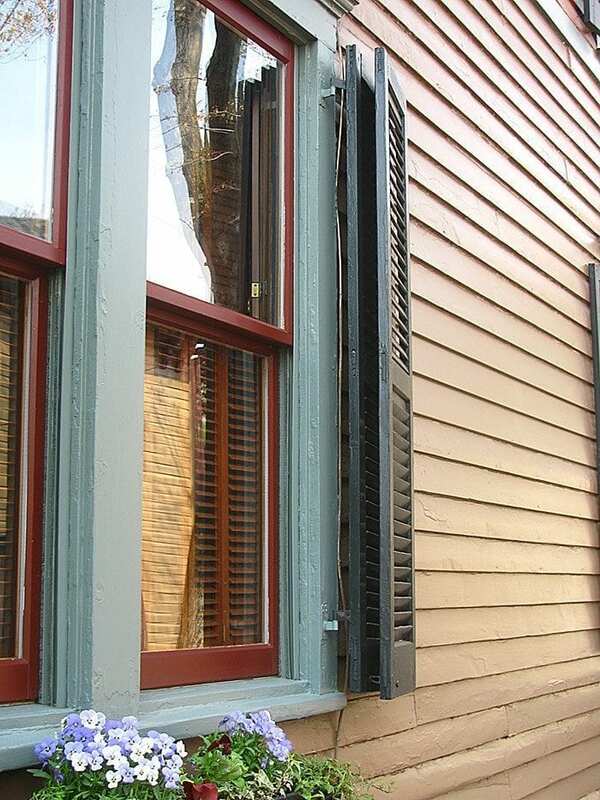 Depending on the style of your house, each window does not have to be shuttered. 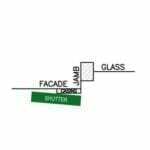 This is determined mostly by architectural design and window style. For example, on a Queen Anne style house, windows in a tower may or may not be shuttered. 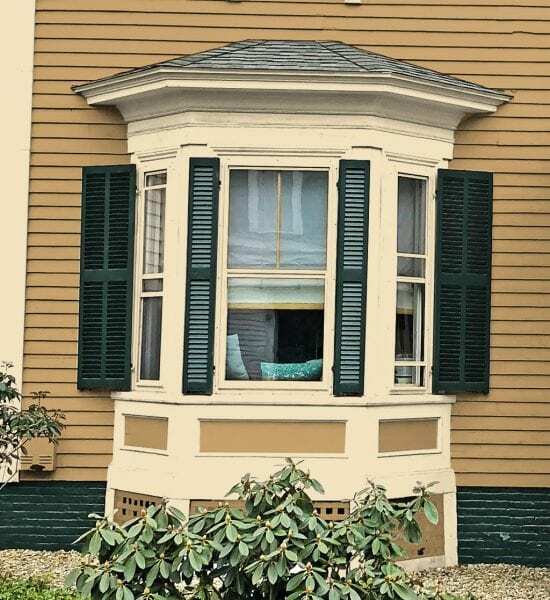 Larger ornate or smaller sized windows can be left without shutters or may only need one shutter on one side of the window (fit to cover the entire window). Think in terms of shutter use. 1.) Back in the day, would it have been practical or useful to have shutters on this window? 2.) If not useful, would it provide balance in design or match another window with shutters? Colonial style architecture is symmetrical and you need to maintain this symmetry. 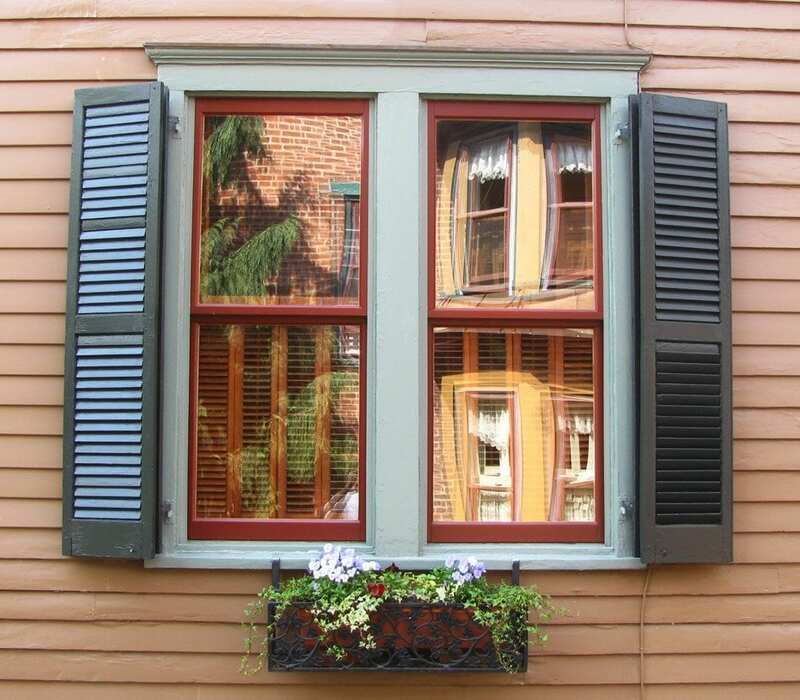 A Ganged window is two windows side by side separated by a mullion (a vertical piece of wood separating the windows – part of casing). In this situation, you have a few choices (not in any order), but first look for ghost marks of earlier hinges. 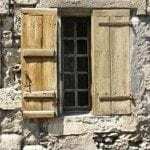 If the window had shutters there would be ghost marks of hinges visible. 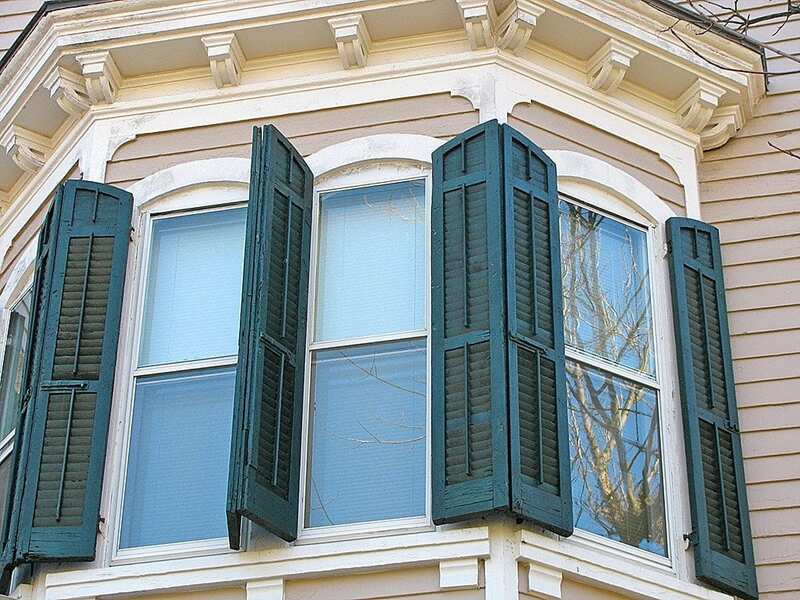 Attach a large (double size) shutter, the size of the window on each end. Mount double shutters at each end. The shutters would appear single, but actually are two hinged shutters, folded over. 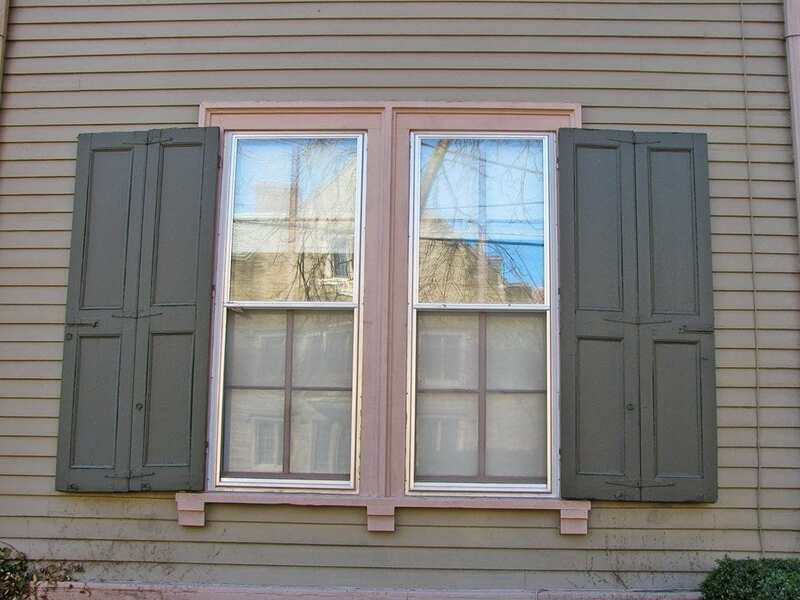 The shutter will close from one side for each of the two windows. The visual effect of patterns will not be disturbed. 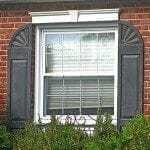 Mount four shutters in the manner you would normally if the window were not Ganged. 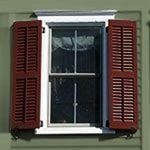 Since there is minimal space at the mullion between the two windows, the shutters will remain in a semi-opened position and held in place with a tie-back attached to the sill, extended out to the shutter. I have seen this method in original 19th century design plans. If you find ghost lines, you have your answer. 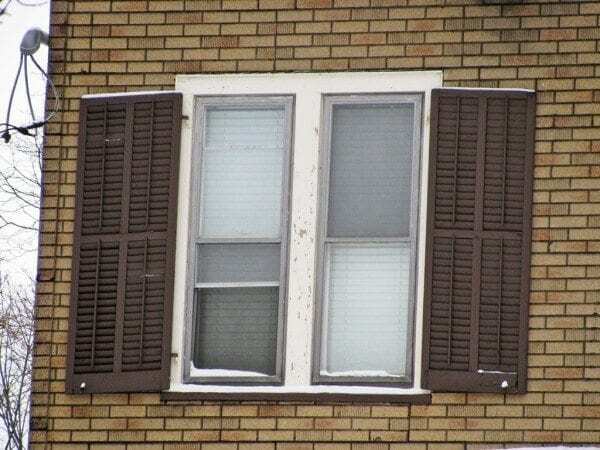 There will be other situations where a window is next to a down-spout or a wall of a house where the shutter will not be able to be parallel to the house when open. Do not omit the shutter. Unless noted all examples are historically correct. 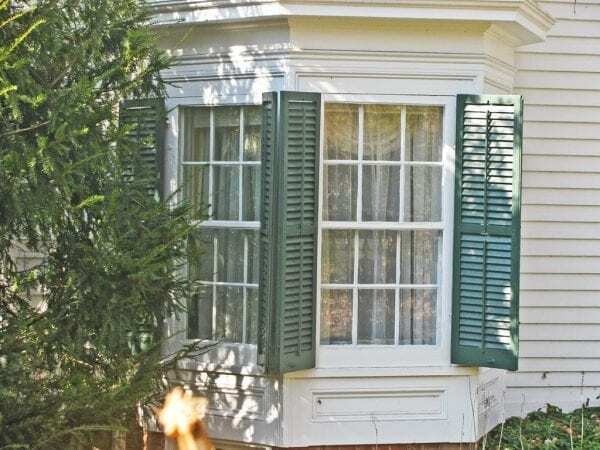 Double shutters for wide or ganged windows. 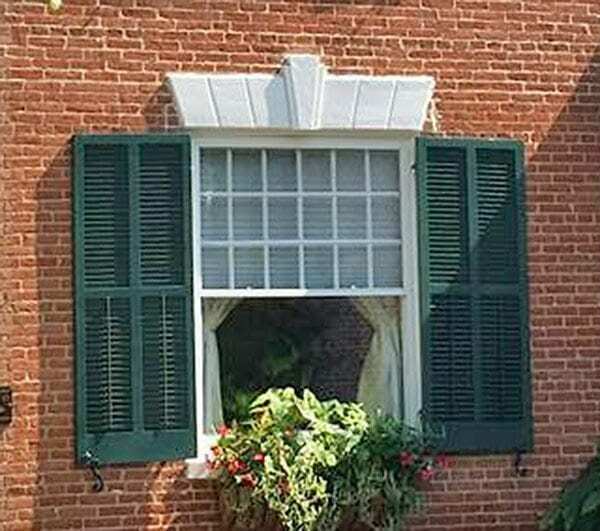 Use these instead of mounting shutters in the center between the windows. 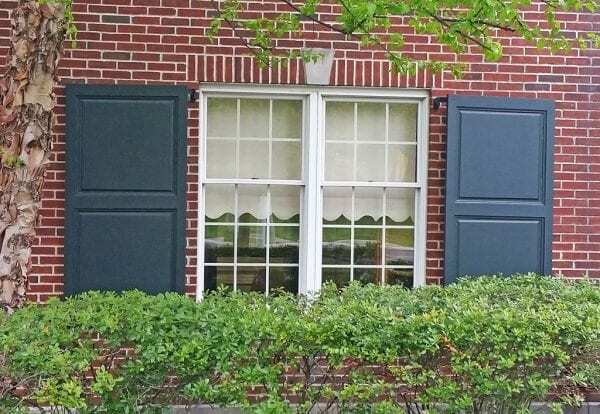 These shutters do not fold. Non folding wide shutters with operable louvers at the bottom. Double folding panel shutters in open position. Notice the hinges giving you the option of hanging them full or folded. An option for double or wider windows. 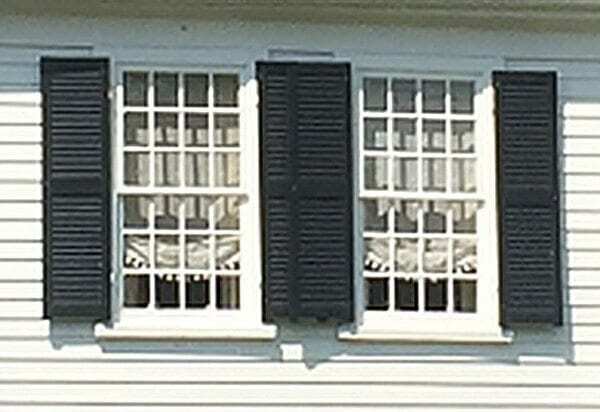 Double folding shutters shown in folded position. Double shutters are folded in half. Side view showing folded shutter. Face mounted hinges. See Acorn snap at bottom to hold shutters together. These shutters are on a bank. 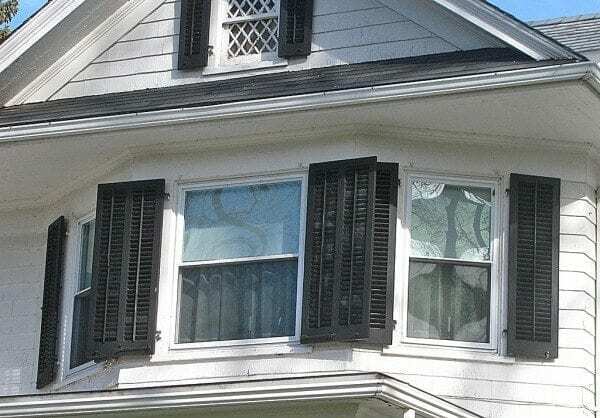 They are way too wide to be single shutters. They must be folding to avoid looking dumb. Additionally they are mounted incorrectly to the face of the brick instead of the brick mold which is probably too narrow anyway. 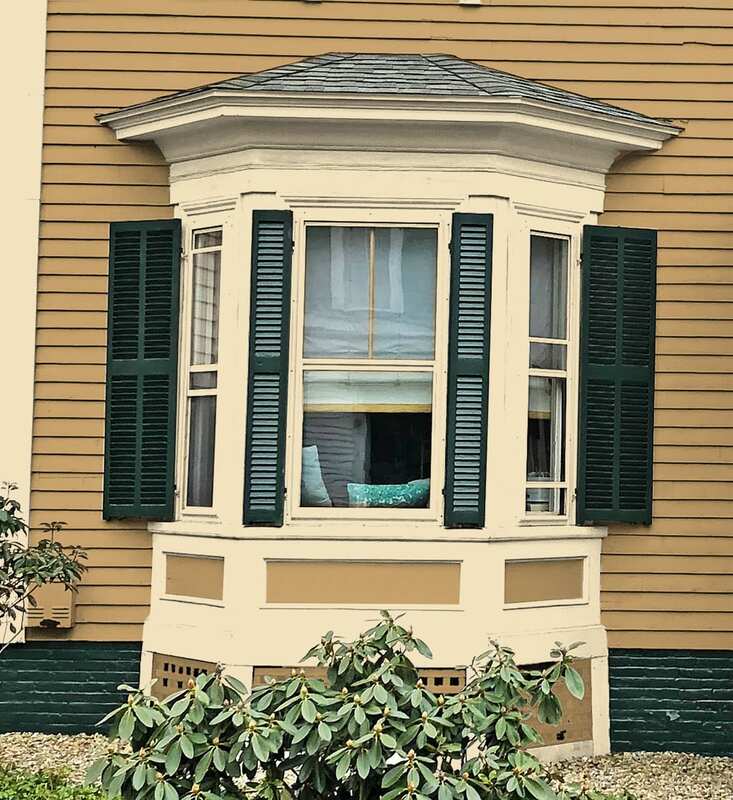 Center bay window is wider and has double shutters that do not fold but overlap. Operable shutters being used on a hot day. The way to attach shutters when windows are too close. How to mount shutters in tight places. 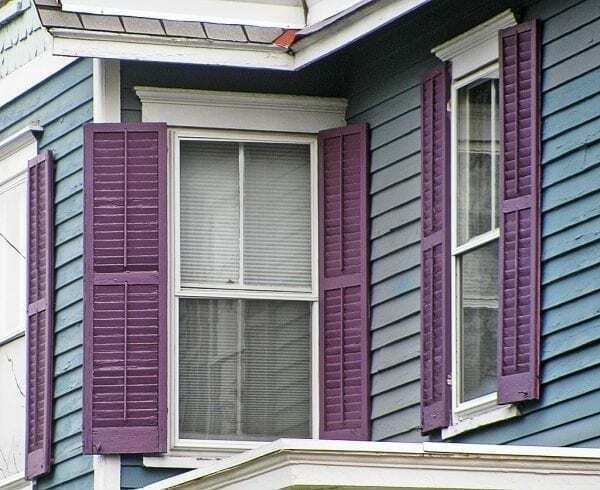 Shutters can still be installed on a bay window. Overlapping shutters on 18th century house. This 1870 Greek Revival has wide single shutters on the sides of the bay and two folding shutters in the center. 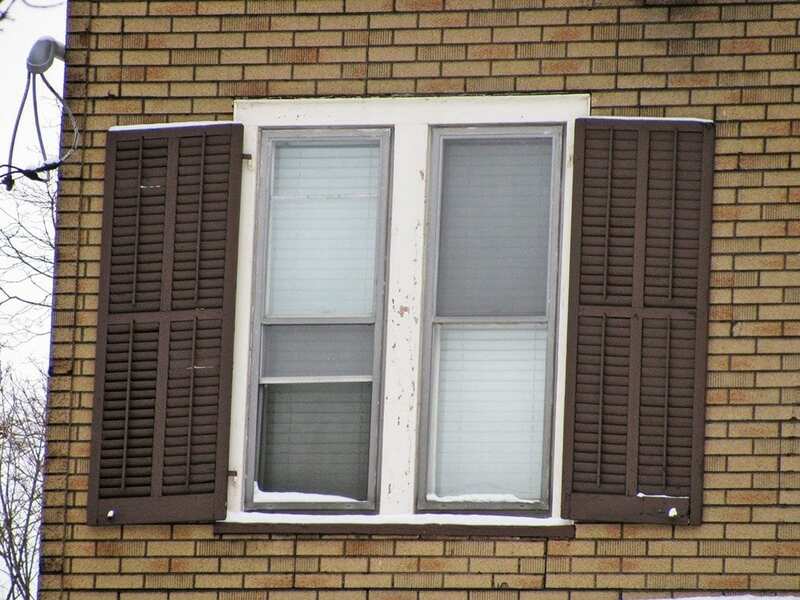 Is there a tool that you can use to close shutters from the inside? I visualize a pole with a hook. Now I have to get on a latter and close them from the outside. Yes there should be but I checked some shutter sites and they don’t have anything listed. I would call one of the manufacturers.